Irish punks Bourbon Brawlers have dropped their new 10 track album Befriend Your Sins which is brimming with energy and wicked punk hooks. They have also dropped their first music video off of the album, “Irish Yoga”. Here is our interview with Bourbon Brawlers vocalist and guitarist Mike Martin. 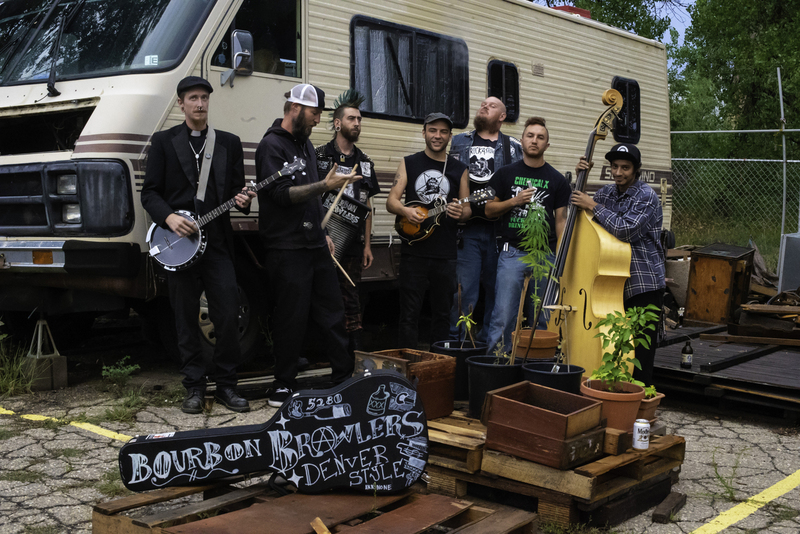 Bourbon Brawlers is a fairly new band but you’re already getting some traction. Do you think that it’s solely based on the solidness of your new album Befriend Your Sins or are their other creative factors in play? There are not many other have bands out there with 6 members (that aren’t ska bands) and we all come from different demographics from within the great wide Denver scene. So we’ve attracted and united a bunch of different arrangements of crowds. Also by collaborating all of our musical backgrounds it’s made us a versatile band we’ve played with street punk bands and we’ve played with bluegrass bands. So what we’re doing has really broken some of the subgenre barriers and allowed us to play all kinds of great shows. It’s great to play with bands like The Goddamn Gallows and Gutter Demons, to straight up skate punk like The Hacks and Bottom Bracket, then bluegrass bands like Tejon Street Corner Thieves, and Crow Cavalier or some straight up dirty blues like Smokestack Relics. For people who haven’t heard your music before can you describe the songs of Befriend Your Sins? It’s a smorgasbord from the punk angst behind Mike’s acoustic guitar and vocals, Raul’s bluesy harmonica licks, Tom’s folky mandolin string strums, Scott’s bluegrass/trashgrass fingerpicking, Snoopy’s thumping psychobilly speed walks on stand-up bass, and Damien’s skin stabbing speed jazz drum style. I feel like there’s really something that appeals to everyone. I’ve heard it described by various peoples’ favorite genre but we’re all pretty anti-genre what it sounds like, honestly to me anyway, is just a good time. After all that’s why people are supposed to get together to play music anyway, just to have a good time, and with all the characters in this band it’s hard not to. We hope that’s what everyone gets when they come to our shows. Befriend Your Sins seems like a fairly personal album why did you go that route and what are some of the stories? We’re all real people with real stories and we let all those real stories, with feeling and emotion, try to seep into the music we create together. When we jam, beyond it being that guaranteed one good time of the week, it’s also our therapy. “The Legend of Shorts McGraw” for instance is all completely true. The song is named after a good friend/roadie of ours who has a huge amount of infamy around him. He’s almost always gonna be at the bar till he gets kicked out and too lovable not to let back in for the following show. That’s kinda how we all see ourselves as well. Yeah we’re probably gonna get in trouble and have too much of a good time… but it’s all in the name of cutting loose and trying to celebrate life. “Befriend your sins” is also a lyric in our song “Light It Up”. Is there a balance when recording of being too rushed versus being given too much time and what is that balance? Well, we recorded this whole album ourselves at the same place we practice so it was more of an issue of being too sober or too drunk. But we all wanted to keep it DIY as possible. We’re not trying to have an over polished sound and we try to keep it as raw and gritty with a live feel to it as much as possible. Almost all of our songs have tempo changes so we didn’t want to use a metronome or auto-tune or any high end interfaces because we all feel that music should be a live, living and breathing animal of its own. We took our time tracking it out but each individual track was pretty much a live take no looping or splicing to “clean things up” and that’s how real music should sound. When writing, do you first have a rhythmic or melodic idea? Please give an example of a specific song’s first spark of an idea and how it was developed into an entire song from there. So for “Light It Up” as an example, we started randomly with first a guitar riff just jamming with drums before practice. Later after we had an idea of where we were gonna go with the melody and structure, we passed around a notebook and collectively wrote lyrics that later changed and evolved to help fit the composition of the melody. Each member wrote out their own parts and then we gave some space at the end to break down so everyone could hear Scott’s riff on banjo that really accented the feel of the whole song. Almost every song was written differently and developed differently as well, but most songs typically start with a few members’ ideas as everyone collaborates on top of it after. Do you have any particular song off the album that you enjoy playing live the most? “Revolution” which we normally open with cause it actually has a message and we’re all ready to grab some Molotov cocktails and start one with the current political and economic situations in the states. “Backseat” as well because it was the first song that was written for this project, almost always the show closer and pertains to the demons that everyone has to struggle with on a daily basis. Have any members of Bourbon Brawlers had professional musical training or are you all self-taught? If you’re self-taught how did you keep yourself disciplined through the years to elevate your skill level? We’re all self-taught we all still learn new things with seemingly every new song we write. I’m a firm believer that technical skills and overly complicated riffs often take away from the true heart of music. It is nice after getting a hold of your instrument long enough to be able to know how to play what you feel in order to have your song portrait the emotions your trying to convey to the listener. Luckily we have all been playing long enough to dial what we want into each song to channel the proper emotions but don’t think any of us will be going back to school anytime soon. As far as the discipline goes… I can say that there’s things that we have all went through in life where it seems there was no hope left, all is lost and there is no place to go from here. At which time our instruments consoled us, we’re not disciplined by any means. We’re all troubled individuals who have found strength through music, our instruments and most importantly the brotherhood that is being a band mate. Possibly the only bond thicker than blood itself. So how does your own music influence you as a person and does it help you through your day-to-day life? Like previously stated this music is totally and completely all of our own therapy. We wouldn’t make it through the week without knowing that there’s music we can play to get that release. Then knowing others out there feel the same way we do and can relate to how we’re feeling when we put the heart and soul into the music we create. That’s more than less why we do what we do, if we didn’t we’d all be crazy or at the very least very unpleasant individuals to be around. How do you physically and mentally preparing for a performance? First we all smudge burning sage over each other while sipping yerba mate. Then 5 minutes of downward dog in a hot yoga room of at least 103 degrees Fahrenheit. Then we all split non-vegan hot fudge Sunday while dripping hot wax on the drummer (he’s a vegan). Followed by trying to re-toxify our bodies with as many cheap drugs and alcohol readily available. Unless the address of the venue ends in an odd number, in which case a bottle of brandy and a glass of brown M&M’s is in order. What are Bourbon Brawlers’ goals for 2019? Release another album and try to contract as many venereal diseases as possible. Let’s just say everyone in the band already knows how to spell gonorrhea, but it’s OK, there is a pill for that. Really though just wanna keep playing shows, meeting people and writing songs. Hopefully we’ll tour but most importantly giving the crowds a good time while having one on stage. I’d also really like to grow an ape drape. Is there anyone you would like to give special thanks to for helping you out in life and music? REAL MEN DON’T USE METRONOMES! I’ll take a Maker‘s Mark easy on the rocks or straight from the bottle.